I didn’t really plan on doing a whole series of Halloween treats for the kids, it just sort of worked out this way. I think these two may be the last of them for this year, but with a week to go I don’t want to bet on it. First up is the eyeball on a fork up top there. All you need is donut holes (powdered sugar works best), white chocolate chips, semi-sweet chocolate chips, and red decorator icing. If you’ve done candy before, skip down to the next picture. You can probably figure out the next six paragraphs. Melt the white chocolate in a double boiler. If you don’t have one, just use a metal or glass bowl and a small pot. A metal bowl will transfer heat faster so the chocolate starts melting faster, but it’s easier to overshoot and burn it. Glass takes longer to heat up, but that makes it easier to control and hold at the right temperature. Put about an inch of water in the pot over medium heat, put the chocolate in the bowl, and put it on top of the pot. As soon as the chocolate starts to melt, turn off the stove. The heat left in the water should be enough to melt the chocolate. If you’ve melted semi-sweet or milk chocolate before, be aware that white chocolate melts — and burns — at a much lower temperature. Once the chocolate is melted, give each kid a fork with a donut hole on it. Let them dip it in and then hold it over a plate (to catch drips) until it hardens. As soon as the chocolate has cooled enough that it won’t burn them, but it’s still soft, give them a single semi-sweet chocolate chip to press in for the pupil. 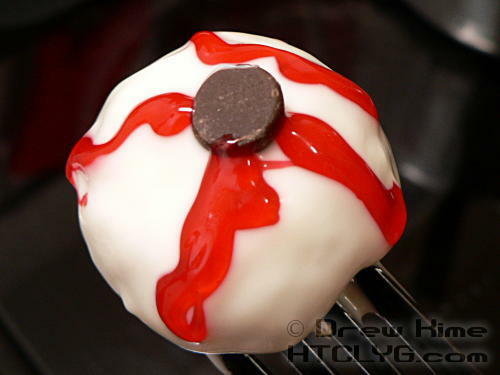 Once the white chocolate has hardened, add the bloodshot veins with the decorator icing. 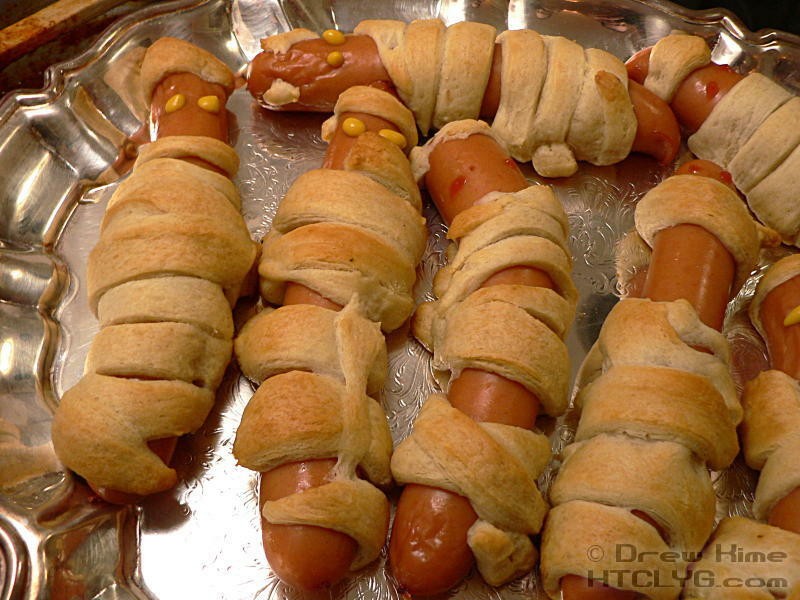 Next up, mummified hot dogs. And no, I don’t mean the ones you find in your 8-year-old’s room when you finally get him to clean it. Take your croissant dough — if you use the stuff in the blue can, I won’t think any less of you — and cut it into strips. Wrap each hot dog up irregularly. Put them on a baking sheet and bake according to the directions for your croissant dough. Add eyes with mustard or ketchup. Our ketchup was kind of runny, so the mustard worked much better. What Halloween treats do you plan on making for your kids? Or yourself? Let me know down in the comments.